There’s never been a better opportunity to purchase our increasingly popular publication ‘Practical Digital Signal Processing using Microcontrollers'. This book is vital reading for anyone interested in Digital Signal Processing (DSP). If you order your copy before January 1, 2014 you take advantage of no less than 20% discount on the regular sales price of £44.90 (€49.90). This practical and accessible text on DSP is an excellent companion when delving into the world of discrete time signals and their use in microcontroller based systems. 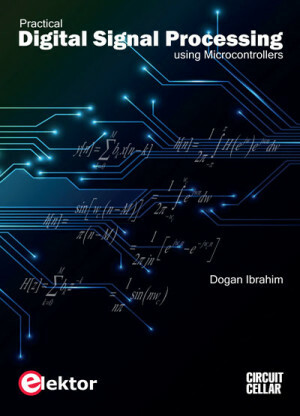 Presented with minimal mathematical treatment and supported by functional, constructive examples and tried & tested microcontroller programs, author Dogan Ibrahim empowers readers to design and implement DSP algorithms using popular PIC microcontrollers. Anyone who orders a copy of this book before January 1st, 2014 will automatically benefit from a 20% discount, giving you even more reason to get a copy early and familiarize yourself with the basic theory of DSP and the process of capturing, analyzing, and manipulation of usually an analog signal. Professor Dogan Ibrahim will be presenting a Elektor/Element14 webinar called ‘Digital Signal Processing using Microcontrollers’ based around this very text. It will be webcast on Thursday January 23, 2014, at 4:00 PM (CET) and is completely free of charge. The webinar will focus on using the high-end PIC18F series of microcontrollers. Frequent reference will be made to this book during the course of the webinar.